When registering a new patron, the Patron Barcode and OPAC/Staff Client User Name are entered as the same 14-digit number. Just a reminder that if a patron or staff member has changed the OPAC/Staff Client User Name (to something easier to remember, for example), the patron must use that username to log into the OPAC. They will not be able to log into the OPAC with their barcode since the OPAC requires them to use the OPAC/Staff Client User Name. Staff members can always change the username back to the 14-digit pin number if the patron requests. Just a reminder that you may place item and patron barcode orders beginning Monday, November 5 until Friday, November 9. The next time item and patron barcode orders can be placed will be January 7-11. • Item or patron barcodes? • Quantity (There is a minimum order of 500 for both item and patron barcodes). • Library name, contact email and telephone number. Advanced cataloging is again being offered in webinar format at the end of this month. Participants need to register for both sessions in order to receive their Cat1 login. The course is designed to teach Evergreen Indiana catalogers how to do original cataloging and advanced techniques such as merging records. All attendees must have attended the basic cataloging class or have been trained by an Evergreen Certified CAT1 cataloger. Promotional items in celebration of Evergreen Indiana’s 100th member will be sent through InfoExpress in the next several weeks to each Evergreen Indiana library! 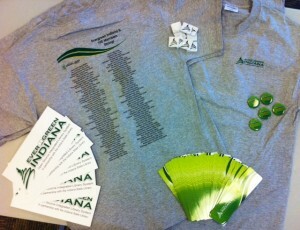 All libraries will receive t-shirts, a bag of Evergreen chocolates, several pins, window clings and bookmarks! You choose how your library will distribute the items. Thanks to Morgan County Public Library for submitting the LSTA grant which made this possible!